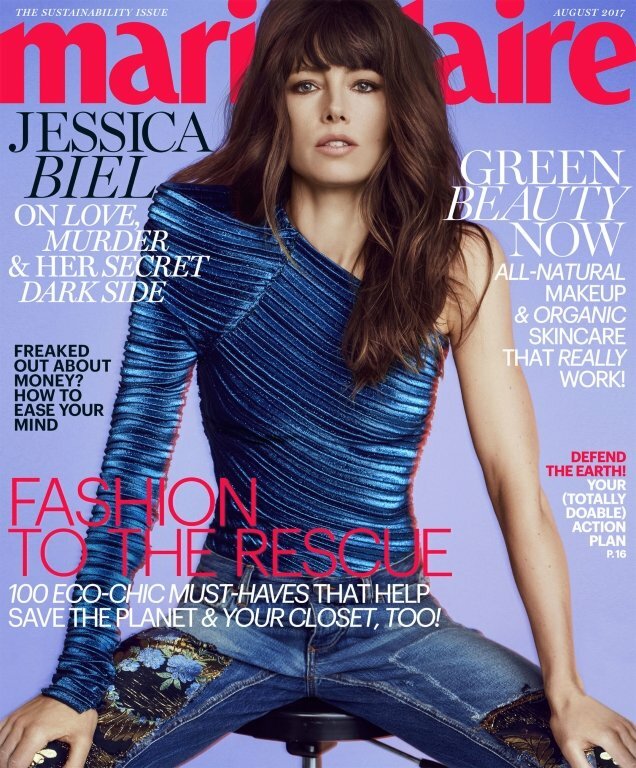 You have to hand it to Marie Claire this month for securing a beautiful, yet underexposed, cover star. After delivering a wonderful Chrissy Teigen cover last month, actress Jessica Biel greets us on the front of the August 2017 edition, shot by Txema Yeste, wearing a show-stopping metallic Mugler top teamed with Dolce & Gabbana embroidered jeans. Our forum members barely recognized Jessica. “LOL, that could be anyone! I definitely wouldn’t have recognized her. It looks like they morphed her face with Kate Beckinsale’s or some other,” exclaimed mistress_f. “She looks entirely unrecognizable. I wouldn’t have any idea who this is, if I came across it at a newsstand. She looks a little like a young Catherine Keener…?” quipped happycanadian. “OMG, yes. It’s baffling!” said dodencebt, referring to the airbrushing post-production. SallyAlbright couldn’t have agreed more. “So bad, it looks like the hair isn’t actually on her head or it’s just a giant hairpiece that is too big to fit on the page. Her face is overly Photoshopped too. Really bad!” she announced in the thread. “This looks nothing like her! Wouldn’t even know it was her if the cover didn’t say so,” Handbag Queen stated. “She is unrecognizable on the cover. Bad Photoshop, bad, bad Photoshop,” ranted ThatGuyPaul. Care to see more? Check out some previews of Jessica’s cover shoot and join the debate here.